(Nanowerk News) Carnegie Mellon University students have received a $40,000 grant from Constellation Energy for their research under way to develop a competitive solar-powered 18-foot-long racing boat. "We are elated with this grant as we research to improve the technologies that go into our boats, and we are working toward competing in the DONG Solar Challenge in the Netherlands in 2014, one of the premier solar boat races in the world," said CMU Solar Splash team leader Nathaniel Krasnoff, a junior mechanical engineering major from San Diego. "This is the largest grant our team has ever received, and we are so grateful for the opportunity to continue our work toward developing cutting-edge, renewable energy technology." The team was one of 10 programs selected nationwide to receive the "E2 Energy to Educate" grant, which comes from the Constellation Energy family of retail electricity and natural gas suppliers. Constellation is a subsidiary of Exelon Corp., which is one of the nation's leading energy providers. The grant is designed to "enhance student understanding of the science and technology needed to address energy issues, and reach and inspire students to think differently about energy." "I think this kind of grant program ultimately helps students better understand the need for creating a future built on sustainable energy," Krasnoff said. "We're very proud to sponsor research and education programs that will help prepare a new generation for energy opportunities and challenges that lie ahead," said Kenneth Cornew, president and CEO of Constellation Energy. 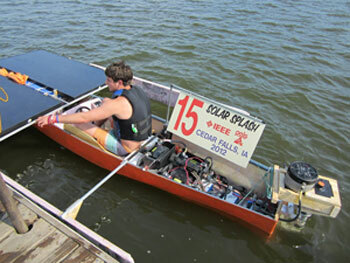 CMU's Solar Splash team competes in intercollegiate regattas that promote energy conservation while giving students hands-on engineering experience in a competitive setting. More than 30 students from the Mechanical, Chemical, Materials Science and Electrical and Computer Engineering departments, in addition to the School of Design, the School of Architecture and the Tepper School of Business collaborate and compete at the annual Solar Splash competition, which involves various sprint and endurance races for fiberglass and carbon fiber boats. For more information about the Constellation Energy education program, see http://www.constellation.com/community/pages/community-overview.aspx.